BRYAN EATON/Staff Photo. 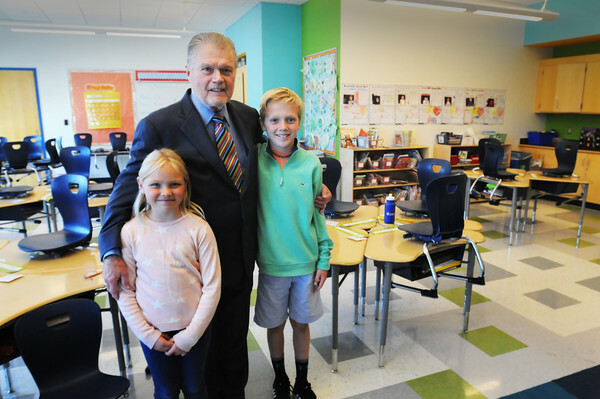 Jack Bradshaw, past Newburyport official and former director of the Newburyport Redevelopment Authority poses with his grandchildren Harper, 8, left, and Caleb Bradshaw, 10, in a classroom at the Bresnahan School in which he made a donation to the Newburyport Education Foundation to name the room in honor of them and his family. The funds raised with Bradshaw's donation, and that of others, will go to transforming the Nock/Molin Library into a state-of-the-art learning common and upgrades to the digital lighting and sound equipment at the Newburyport High School auditorium.